Guidance, Mentorship and Healing that will help you Activate your Personal Magic. you want to understand and express your intuitive gifts. You desire the healthy, fully actualized expression of your personal magic. You are ready to trust yourself as a practitioner and integrate your original medicine. Go from feeling unsure and alone to being fully activated, integrated and expressed. Who is I AM Medicine for? You are a Reiki Master, Shamanic practitioner, healer, yoga teacher, bodyworker, acupuncturist, naturopath. You are a coach, therapist, mentor, facilitator, visionary entrepreneur, spirit-aligned business owner. You are an empath, heart-centered human, Lightworker, creator, possibilitarian, artist, magic maker. Do you feel like you've forgotten who you truly are? What if it were possible for you to rediscover the answers to those questions? I AM here to help you remember who you are. You. Yes, YOU. Your truest Self, your innate essence, your core nature, and the expression of your Original Medicine. This amazing energy still exists within you, but it might be just under the surface. I'm sure you've felt it already--otherwise you wouldn't be here. What would be possible if you lived unapologetically into the silhouette of your Soul? We are all our own Medicine, to ourselves and to the world. The core essence of our Be-ing--our I AM--the innate, original frequency of our vibration is exactly the thing that we most need (and the only thing we need) to be whole. Your Original Medicine is the purest, most authentic expression of your core essence--your I AM. Your Original Medicine is the actualization and translation of your core essence into your lived experience. First, the I AM. Then, the Medicine. What does it mean to reclaim my Original Medicine? You are a Divine Embodied Being. You may live in a human body right now, but you are far more than your physical form. You are Divine, embodied. When we learn to recognize and integrate those parts of ourselves that are pure Spirit, we come into our I AM. We reclaim our place in the order of things. We come into right relation with our truest Purpose, and reclaim our Original Medicine to be who we are and enact our Sacred contract. The Earth Game is one of remembering. A clause in the soul contract of most humans dictates that we begin our journey to Earth by forgetting who we are. This enables us to play with free will and empowers us to learn soul lessons. However, part of the sacred task of Earth school is remembering and rediscovering Spirit in our cells, and the Magic in the mundane. The more we can anchor the Divine into every facet of our lived experience, the more we remember who we are. You are here to live your sacred purpose. ...and it is your Original Medicine that will enable you to do so. Your Original Medicine is the purest expression of the unwavering light at the core of your being, that illuminates your gifts, your lessons, your perfect connection and sense of belonging. Your Original Medicine will help you become a more effective human. Dive deep into your Self. Discover the specific, unique expression of your Original Medicine in the world. Come into full, embodied remembrance of who you are. Shepherd yourself through cycles of initiation to reclaim and fully live your Original Medicine. Fully rewrite and release any blockages and interferences inhibiting the full expression of your Original Medicine. Integrate and embody the role of your Original Medicine in your Self and your craft. You are a human who is called to live a fully expressed life of purpose. You know that you have powerful Medicine to offer, but aren't exactly sure how to ground it in and express it. You feel called to commit to yourself and your purpose in a bigger way. You have a personal practice and understanding of your energy field. You know that you are a part of a global shift in consciousness and are ready to claim your role as the co-creator of a new paradigm. In our work together, you are receiving the benefit of my Medicine. My job is to show up and support you in whatever way you need, drawing from all my knowledge and experience. 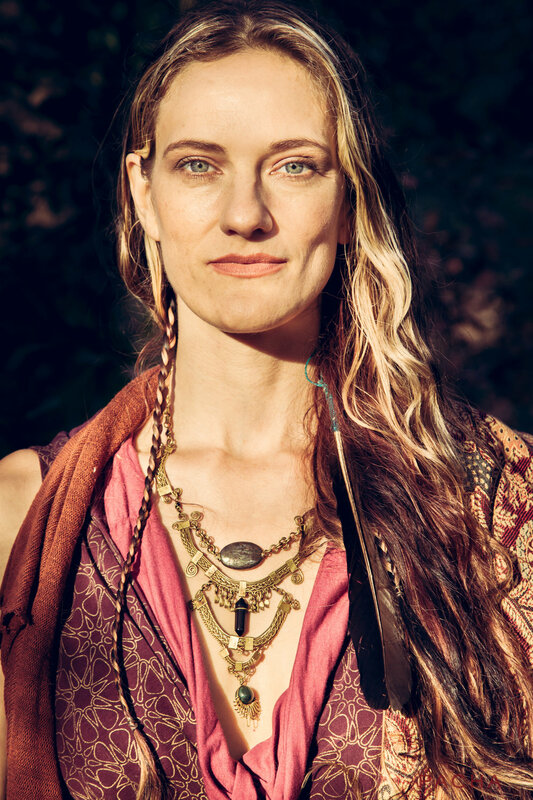 My Medicine includes intuitive mentorship, energy healing work, Shamanic journey and healing, Alchemical practice and philosophy, ritual creation and design, movement and embodiment practices, Soul Code activation, guided meditation and journaling practice. You are invited to attend special events as my guest! Monthly Lunar Alchemy circles, certain workshops and client-only invitations are open to you to attend for free—all you need to do is let me know you’re coming. Also receive discounted admission to I AM Lightworker: a four-day LIVE training for Lightworkers, October 10-13, 2019. My intensive, one-on-one Spiritual mentorship work is very important to me, and I want to be accessible to those people who are ready to reconnect with their Original Medicine. I used to charge $1800 per month for someone to be my client. That price point no longer feels in alignment to me, as I sit with my own Original Medicine and how I AM here to serve. The more I find myself in my own center of Self, the more I know that it is absolutely vital that we all be able to receive support in remembering and reclaiming who we truly are. For anyone who is ready to do that, I want my work to be available and affordable to you. The scheduling and direction of your sessions is up to you! I offer you complete autonomy in choosing the focus of our work (of course I will guide and co-create with you). You will also have complete autonomy in keeping track of and getting your sessions on the calendar. If you don't schedule your sessions within the month, they expire (unless we prearrange a different schedule). Begin your I AM Medicine journey by filling out and submitting your application. Upon acceptance into I AM Medicine, you will receive a payment form. You will be immediately billed for the first of six payments. The remaining five payments will deduct automatically every month. You are responsible for completing all remaining payments. What is I AM Lightworker? Is this training included? I AM Lightworker is a 4-day LIVE healership training course (Oct 10-13) for healers, practitioners, coaches and visionary changemakers. As a mentorship client, you receive $200 off the price of the training. I personally review every application. If it feels like we're a great fit to work together, I will send you a welcome email within three days that contains further details and instructions on how to pay your deposit. You will have five days to accept your spot before it is offered to another applicant. >>Don't see your question? Send me a message! Once you're enrolled, you'll receive a private booking link to schedule your sessions as you like. You are responsible for putting yourself on my calendar. What if I can't get a time I want or I don't use all my sessions? If there are absolutely no booking times that work for your schedule, please let me know and we can work it out. Sessions do not roll over from month to month, so please make sure to use them! Sessions that are unused by the end of the month expire, unless you arrange otherwise with me at least two weeks in advance. What if I am in Portland and want to come see you in person? If you are in Portland and would like to come meet with me in person for your sessions, I have a limited number of spaces available on a first-come, first-served basis. Please discuss this option with me and we will schedule you accordingly. Here are some of the great things that prior clients have to share about working with me. "I am beyond thrilled to be participating in Michelle Hawk's intensive transformation program. As a healer and guide, I often don't get enough energy work or support myself with the magical community that I have access to even when I know I need it. This seems to be a common thread for many in my field. I am so happy to have committed to this deep dive with Michelle as she is truly an incredible practitioner.